Free Download Games from SoftAK.com - Cards/Casino and much more free,shareware,demo games. The man, who stands in the foreground of the picture you see, is the strongest and the most dexterous in emperor's regular army. This evening he is on sentry duty, because of the following occurrence. A month ago Japanese emperor had built a new palace and a park to everyone's entertainment. Men, women, boys, girls and people in years loved it very much. There were many calm places for old people, several secluded nooks for loving couples, an amusement park, a field for childish sports and one special area with playing machines. That area was the centre of everyone's attention and that kind of amusement used to be people's big draw. For an obvious reason the park was simultaneously the object of admiration and the object of envy for other rulers. Everything took its normal course when one night several thieves made his appearance in the park. That people were sent by a Chinese emperor. He did it not to be bursting with envy. First of all thieves ought to pilfer game machines, but they couldn't as they were mounted an honest effort. That fact made them malicious and they began smashing up the park. After their dirty deal they disappeared. Now the park is reconstructed and the guardians are working in it. For example, this long haired attractive guy guards the slot machine. The machine's drum designed in Japanese style. When you place your ante, the chips lower themselves, and the guy pulls a handle. While the drum is spinning you can familiarize with win combinations you are to aspire to. They are in the right part of the game space amazing both with graphics and Japanese style. 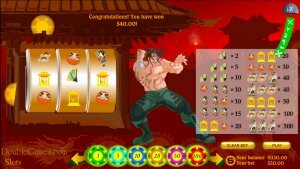 Try the guardian's lucky hand and win much money!